Over 50 automated bicycle stations and over 270 bicycles are operating in the city of Almaty today. 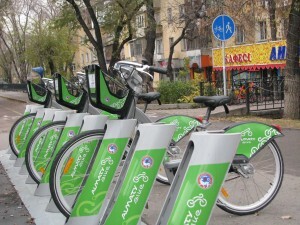 Within the framework of the first stage of the project, “Almaty Bike” stations appeared on the central streets and near some metro stations. The stations are operated by using energy from solar batteries and are equipped with parking terminals with bicycles. * Remember – returning your bike to a station every 30 minutes means that you ride absolutely FREE!